Friday March 1st 1901 I was busy about the house all the forenoon. Will went to town in the afternoon. Father & Mother came out to tell us they had received a dispatch from Colorado that Lee was very bad and Ott started there at five oclock this morning. They stayed all afternoon. 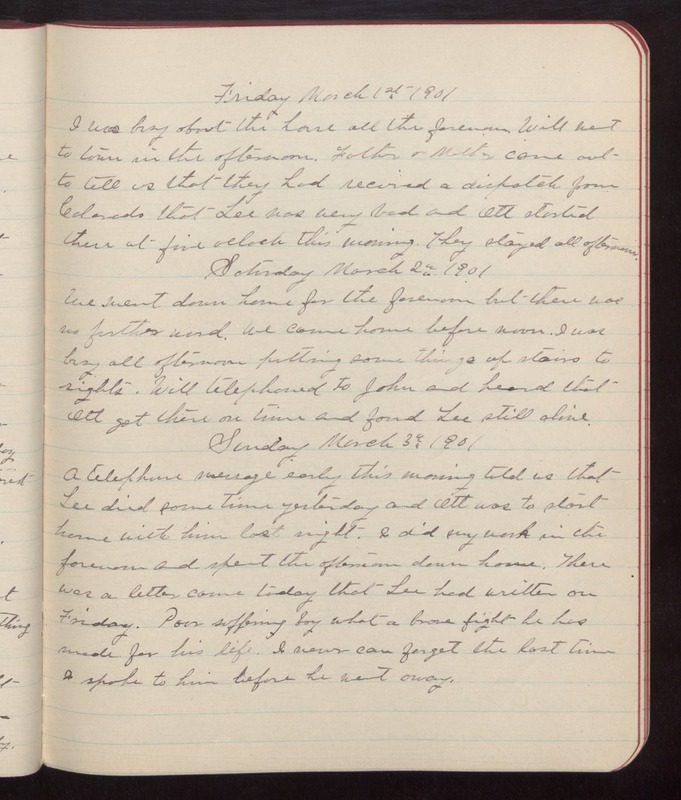 Saturday March 2nd 1901 We went down home for the forenoon but there was no further word. We came home before noon. I was busy all afternoon putting some things up stairs to rights. Will telephoned to John and heard that Ott got there on time and found Lee still alive. Sunday March 3rd 1901 A telephone message early this morning told us that Lee died some time yesterday and Ott was to start home with him last night. I did my work in the forenoon and spent the afternoon down home. There was a letter come today that Lee had written on Friday. Poor suffering boy what a brave fight he has made for his life. I never can forget the last time I spoke to him before he went away.